Azerbaijan plans to open its next trade and wine houses in Shanghai, China. 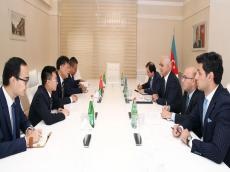 Azerbaijani Economy Minister Shahin Mustafayev made the remarks during the meeting with Chinese Ambassador to Azerbaijan Wei Jinghua, adding that Azerbaijan pays great attention to cooperation with China. It was stressed that the Trade House of Azerbaijan, opened in September 2018 in the Chinese city of Liuzhou, will contribute not only to the expansion of trade and economic relations between the two countries, but also to the recognition of Azerbaijani products in China and cooperation in the sphere of culture and tourism. The minister noted that Azerbaijan’s wine house has already been opened in the Chinese city of Urumqi and now, trade and wine houses are planned to be opened in Shanghai. During the meeting, the views on the first China International Import Expo, to be held on November 5-10 in the city of Shanghai, were exchanged. The Azerbaijani delegation will visit China to participate in the exhibition. The exhibition will feature products and services of more than 30 companies of Azerbaijan. During the visit, prospects for expanding economic cooperation with official representatives of China will also be discussed. The minister went on to say that Azerbaijan’s relations with China are developing in the areas of logistics, trade, investments, tourism and the humanitarian sphere. Jinghua, in turn, stressed that China is interested in the development of relations with Azerbaijan and shared his opinion on the prospects for the development of cooperation. Economic ties between Azerbaijan and China play a large role in the bilateral political relationships. The Great Silk Road is a general name of a caravan road, which has been the main two-way trading bridge of East and West since the 3rd century BC up to now. The Great Silk Road starts in Japan and China stretches up to Europe cutting through India, Afghanistan, Iran, Central Asia, Caucasus, Asia Minor, Northern Africa including connecting the Indian Ocean, the Chinese Sea, the Japanese Sea, the Red Sea, the Caspian Sea, the Black Sea, the Sea of Azov and the Mediterranean Sea. The main export products from Azerbaijan to China last year were chemical products, fuel, and plastics. From China to Azerbaijan over the past year were imported electric equipment, vehicles and spare parts, clothing, ceramic products, household items.